Hasn't everyone played a hunter? That's what I sometimes ask myself. 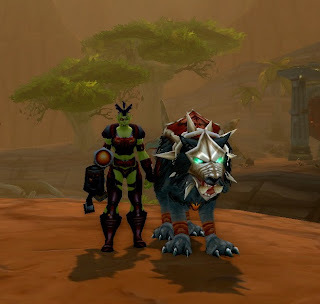 My very first character, called Mendak, was a Dwarf hunter, he had a pet-bear from Ashenvale called Ursa, and boy, was I a newbie. I remember loggin on him once, with some more knowledge, and I just was laughing at my equipment. Everything was hunter-gear, wasn't it? Alas, poor Mendak, he was on the Ghostland server, and in my Horde-only empire there, he had to go. He was replaced by, and I quote a friend; "The ugliest female orc I have ever seen." She was called Miriani. Miriani reached level 70 during the fun-patch just before Wrath of the Lich King, but she did a quick Zul'Aman raid. She was my third character to reach 70, and was (still is) a miner/jewelcrafter. After XII she was put into our friends-guild, and she stayed their a while, up until the ICC-summer. She was then transfered with a lot of stuff to Argent Dawn, had to be renamed to Luaran, and was turned into a Draenai for a short while. She is now an Orc again, level 85 and made her first steps onto Pandaria. However, I don't know how long she (and her companion Gowron) will be on AD. those are two spots I could use for Alliance Alts, maybe the new merging of servers will help. In the meanwhile, during Cataclysm, I levelled an Alliance Hunter on Argent Dawn, called Forak. He was actually my third character to reach 90. And he is a real farmer. 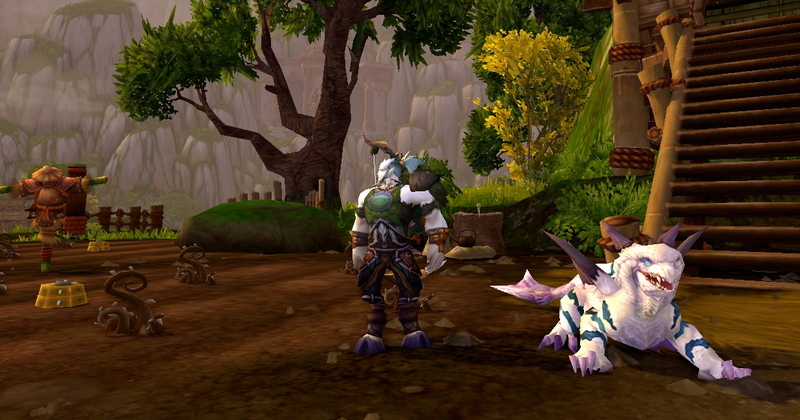 Mining and Herbalism, although mining may be axed soon to make him a flask or potion master. I am not doing much with him, he is now actaully farming ore on his farm, so here have a picture of him, with his pet Picard, on the farm. Well, it was said by a Tauren..so..